The turnaround Billy Casper Golf has engineered at East Hartford Golf Club certainly hasn't gone unnoticed. Golfers have been kind enough to write to local media sharing the story and appreciation for what they're seeing at their course. Now the community has formally commended BCG for its efforts at the Connecticut course. 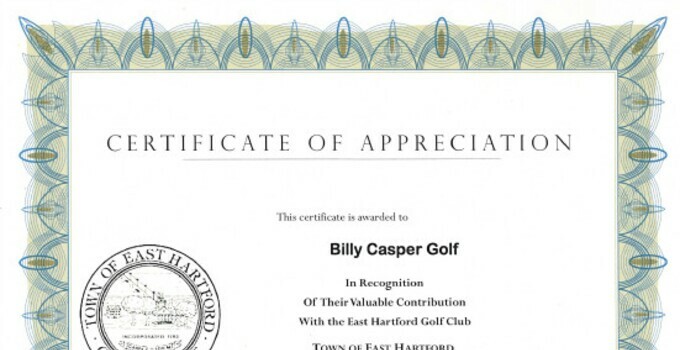 The Town of East Hartford's Economic Development Commission has awarded Billy Casper Golf with a certificate of appreciation "in recognition of (its) valuable contribution with East Hartford Golf Club." The EDC works to promote the growth of East Hartford "through business visitations, marketing and outreach to current and new businesses." Nearly a year into BCG running the course, the results are clear and the path forward for East Hartford Golf Club looks headed for even greater heights.